Amy Vautin lives in Wheaton, Illinois (USA), a suburb of Chicago. Her parents first fostered her skill in the arts, providing classes as well as outlets for displaying her work. Her father, a neurobiologist with professional interest in how the brain perceives colour, encouraged her to delight in sight and perception, introducing her to elementary colour theory and optics using stereoscopes, prisms and the Munsell colour system. Amy has written beautiful letters by hand since the age of seven or eight, when her maternal grandfather first demonstrated the basic techniques of traditional calligraphy. That initial acquaintance with hand lettering deepened as she studied calligraphy in her teens, executing her first commissions while still in high school. As a young adult, she also pursued coursework in botanical art and illustration, working in various media including formal watercolour and pen and ink. She graduated from Wheaton College, a private liberal arts school with Christian commitments, earning her bachelor’s degree in literature and minoring in studio art and German. Her undergraduate course of study allowed her to explore art history, ceramics and graphic design, which have broadened her interest in typography and letterforms in relation to art and architecture throughout the centuries. 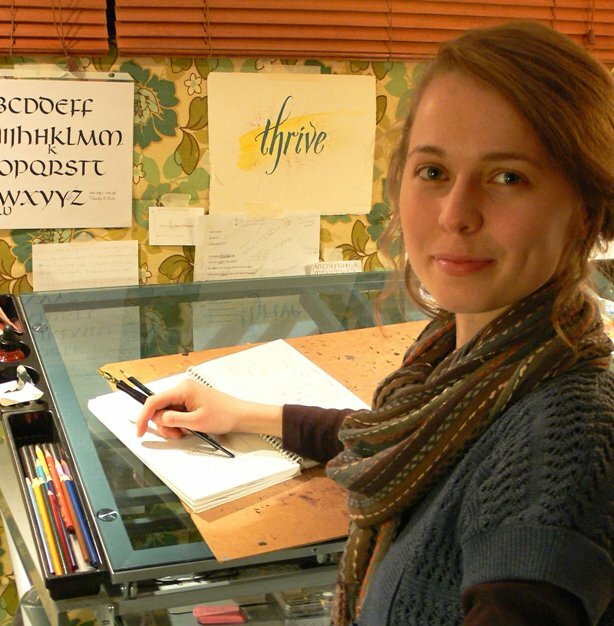 She is a member of the Chicago Calligraphy Collective, a guild for lettering artists. She brings her thumbnail sketches to life from her home studio. My greatest insights find their beginnings in the very words of the God who speaks and in the words of the thinkers, writers and poets, who reflect what this God says. I look for the kind of thoughts that provide a vision check for the audience—words that read the viewer. I delight in thoughts that have been so well worded that they illumine and further order the world, bringing the light of clarity where there has been confusion and darkness. Beginning as a student of words, I ask questions of a text until I am satisfied that my sketches portray a visual explication of what the text conveys. I then stand in the intermediary position of an interpreter or exegete while I render my ideas on paper. Calligraphy allows me to enjoy the bonus of internalizing each word I write, freeing me to memorize as I connect meanings. Since I also love the combination of word and melody, I always fill my studio with music to accompany me as I work. When I am depicting a song or hymn text, I listen to different settings of the piece to help me determine the most fitting layout. I like to think of my work with hymn texts as an exercise in synesthesia, a cognitive condition in which sensory stimuli cross in the brain, creating a multi sensory perception. 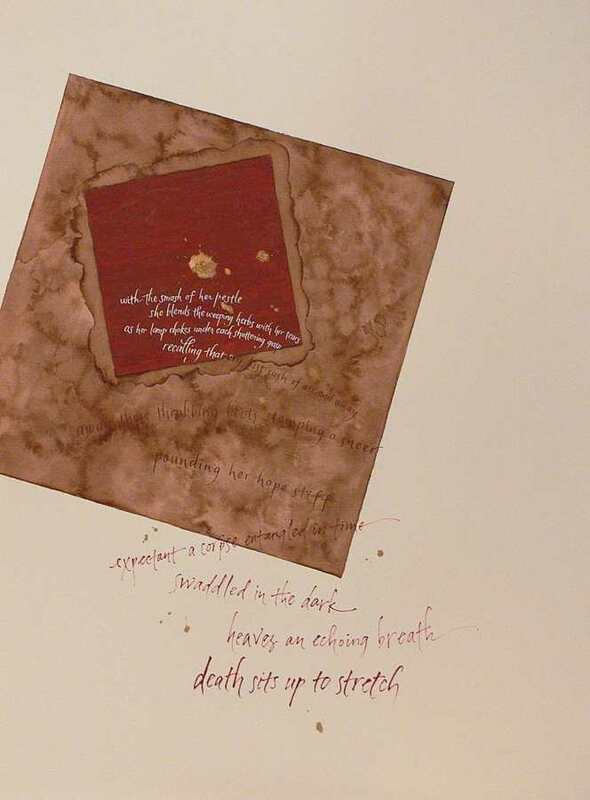 Often, the reworded text of Scripture within a song suggests a typographic play as I visually interpret both the meaning and the tone of a text as offered through the time based medium of music. However, I recognize the challenge of dealing primarily with text within a broader Christian context that prefers the seemingly safe and nonrepresentational word to the emotive wordless image. 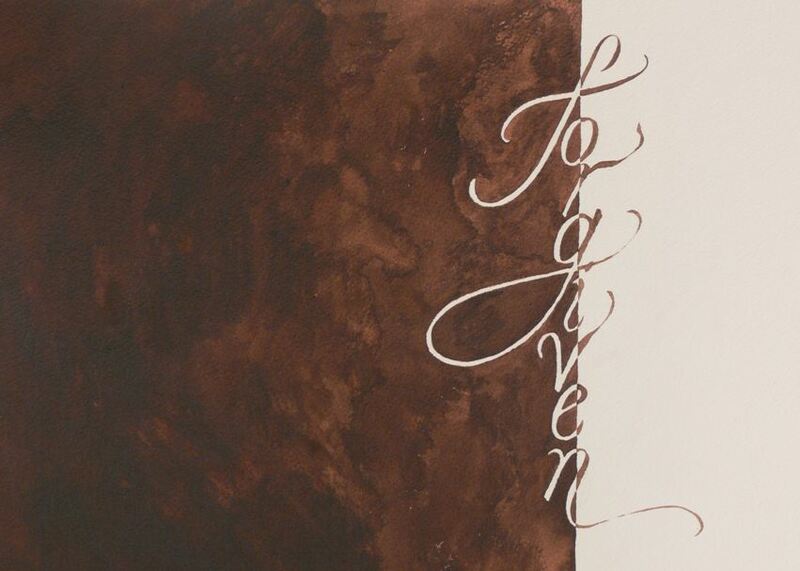 My calligraphic work consistently meets with enthusiasm in my primarily Evangelical arena. Within faith traditions that are unwitting heirs to an iconoclastic past, I stand accepted, granted the position of artist without the familiar need for a theological apologetic for the arts. I also recognize that scribes throughout time have both preserved and distorted the words they transmitted. In the gospel accounts, first century calligraphers incurred divine disgust for twisting the meaning of the words they wrote. Centuries later, calligraphers of a monastic calling preserved and defended words that have shaped our faith. As I stand within these scribal traditions, I enjoy a position of responsibility and freedom. I want viewers of my work to catch their breath over how stunning our God is. I aim to awaken, teach and inspire, inviting a faith response through colour and text. 1. Forgiven, ink on paper, 28 x 35.5 cm. I began this piece with the beloved opening lines of English poet George Herbert’s “Love (III)” in mind: “Love bade me welcome: yet my soul drew back, guilty of dust and sin.” The muddied anguish of guilt and regret forces our eyes toward the tantalizing hope of newness, joyfully streaming across a seemingly unbreachable dividing line, which is the asking and receiving of forgiveness. The earthen brown of guilt disappears with God’s welcome forgiveness, but Peter’s muddied feet remind us that on the other side of victory is our need for the splash of divine washing, a reminder of past and present forgiveness that will one day be complete. 2. 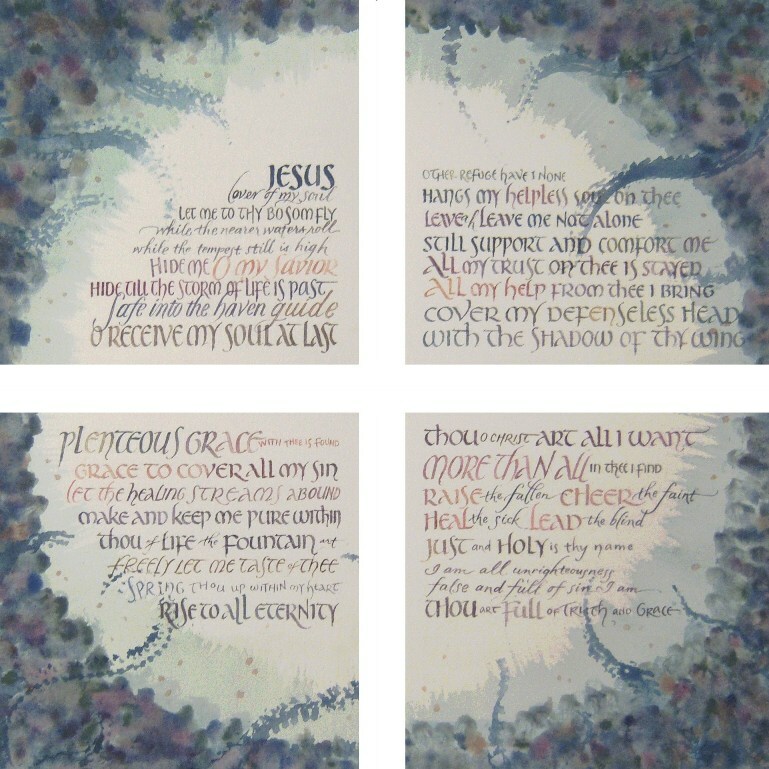 Jesus, Lover of My Soul, mixed media on paper, suggested overall layout measures 42 x 42 cm with each of four verses measuring 19 sq. cm. Text by Charles Wesley (1707-1788). Like many songs of the faith, this hymn invites its readers to contemplate our good God through the perspective of the cross. I viewed each of the four verses of this hymn as offering a distinct entrance to the cruciform nature of life, with the words relating to the cross that forms between the edges of their frames. In the text, we find God in Christ celebrated as the all sufficient One who relates to us as Lover, Savior, Refuge, Defender, Comforter, and Healer. My favorite setting of this hymn text is Aberystwyth, a Welsh melody that prompted my choice of letterforms inspired by uncial as my acknowledgement of the historically strong faith legacy of the British Isles. 3. Undone, gouache and ink on paper, 56.5 x76 cm. 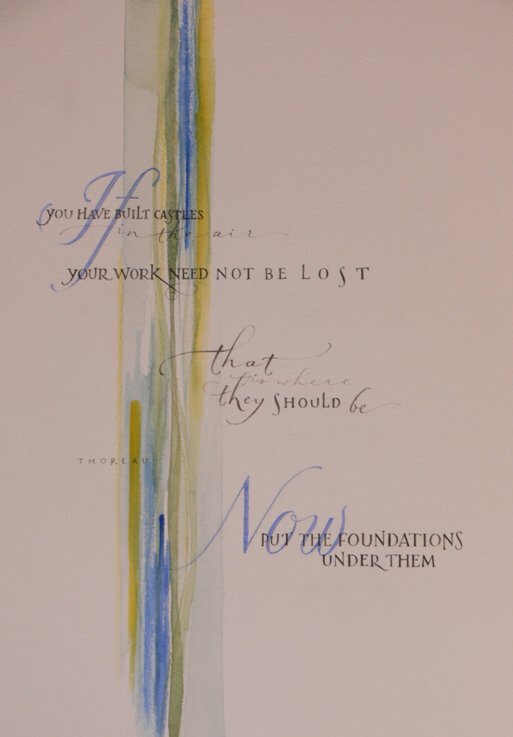 Text by the artist, composed in response to the silent days between Christ’s death and resurrection. This piece is an unfolding triptych of the interior, offering the uncertainty of the liminal space between Christ’s death and resurrection. Expecting to bury her memories along with the embalming oils that she prepares, a nameless female disciple opens a doorway from her mind’s eye to the recent horror of her teacher’s death. The yet unfinished story releases the viewer from the disciple’s searingly fresh memories of a bloody rock outside Jerusalem, revisited in the glow of her lamp, to a dusty enclosure, intended to be the permanent tomb of her teacher and ours. But this tomb is about to reverse itself, birthing awake the second Adam, the One who is Life. 4. Credo: The Nicene Creed, watercolour and gouache on paper, 56.5 x 76 cm. Text of the Nicene Creed agreed upon at the counsel of Nicaea (AD 325), amended at Constantinople (AD 381). 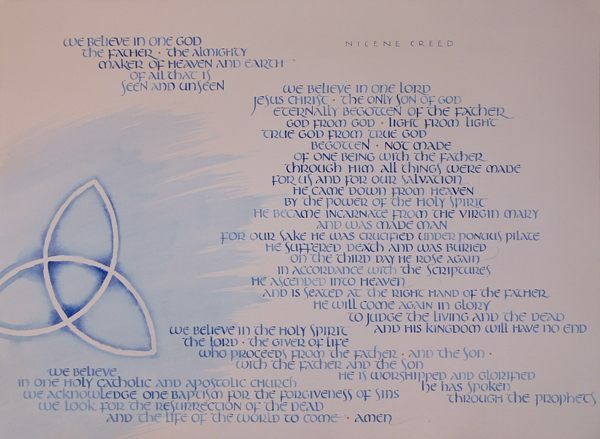 Swirling clockwise from upper left, the text of the Nicene creed opens with an orientation to the oneness of triune God. The Trinity, symbolized for us in the knotted trefoil, extends an open invitation to come, an invitation echoed in the concluding words of the creed with regard to the church. I allowed a portion of the trefoil to bleed off the left side of the deckled sheet, a reminder that there is far more to learn about the Trinity waiting for us in “the life of the world to come.” Paired with the most current English translation, the words build upon the traditional iconographic colour palette, radiating the blue of heavenly splendour and the gold of God’s glory (the contested filioque clause is separated by gold from the main text). 5. Double Vision, watercolour and ink on paper, 29 x 47 cm. Text by Henry David Thoreau (1817-1862). This quote from Thoreau, a prolific nineteenth-century American writer and philosopher, offers a blueprint for the dreamers among us. The vertical watercolour mark anchors a vision of future potential to present actualization. My title, “Double Vision,” suggests this paradox of welcoming tomorrow into today via the far-seeing eyes of a faith that acts.